Inkheart gets a pass for making books seem cool (if scary): if only it could have done the same for movies. 105 min. Warner Bros. Pictures Distribution. Director: Iain Softley. Cast: Helen Mirren, Brendan Fraser, Paul Bettany, Jim Broadbent, Rafi Gavron. Take Jumanji, slap on a Raiders of the Lost Ark climax, and you get Inkheart. Surely that's what the producers of the new PG-rated kids' adventure must have been thinking—that and "Ya think we found the next Harry Potter this time?" Adapted with what may be too much fidelity from the bestselling 2003 German novel by Cornelia Funke, Iain Softley's film plays it safe. 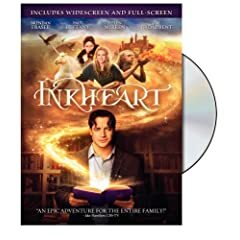 The screenplay credited to Pulitzer-Prize-winning playwright David Lindsay-Abaire follows the broad strokes of the novel's plot without nurturing enough lively idiosyncrasy to make the story come alive, which ironically is what Inkheart is all about. Because this is a PG-rated kid's adventure, Brendan Fraser stars in it (it's some kind of rule of Hollywood physics), as Mortimer "Mo" Folchart, "the famous book doctor." While single father Mo ostensibly travels the world repairing books, he's secretly searching for an incredibly rare, obscure children's novel named "Inkheart." Why? Because Mo is someone nearly as rare: a "silvertongue" capable of conjuring into reality animate objects described in books, just by reading them aloud. Unfortunately, Mo discovered this gift and curse while reading "Inkheart" to his wife and daughter Meggie (Eliza Bennett), the rub being that while he brought characters from Inkheart onto planet Earth, he sent his wife into the medieval world of the novel. In the intervening eight years, the characters from "Inkheart" have also been trying to find copies of the book. One, a fire juggler named Dustfinger (saving grace Paul Bettany), wants to get back into the book to reunite with his wife (Bettany's wife Jennifer Connelly, in an unbilled cameo). The rest are under the sway of bad guy Capricorn (Andy Serkis of Lord of the Rings), who likes it here, thank you very much, and intends to burn every existing copy of the book. It's up to Mo, Meggie (now a spunky, twelve-year-old aspiring writer) and Meggie's great-aunt Elinor (Helen Mirren, pleasingly chewing scenery) to save Meggie's mother Resa (Sienna Guillory). At first, the intrigue in the unfolding plot is compelling, but once we realize that the film's internal logic is shaky at best, it's apparent that silvertongued Mo has brought plot holes out of the book, as well. Mo warns, "I have no control over what comes and what goes," but it's a cheap excuse for allowing his power to do only what the plot requires in a given moment: more chaos would have given Inkheart more spontaneity as well. The plans made by Mo and Dustfinger also frequently come across as needlessly circuitous, especially when Meggie suggests--after twelve years of trying to track down the book--that her father look up the book's author, one Fenoglio (Jim Broadbent). Turns out he's sitting around not far away, sitting on a few copies of Inkheart. Lindsey-Abaire has a bit of fun (I wish he'd had more) with the notion of characters come to life. In a twist on romantic rejection, one character tells another, "It's because of how I'm written, isn't it?" Dustfinger's introduction to Fenoglio also allows a momentary head trip, as the author is confronted by his creation. The hook of the premise remains "novel": at one point, the heroes are penned up in a stable containing L. Frank Baum's flying monkey's, J.M. Barrie's ticking crocodile, a unicorn and a Minotaur. And though the story bogs down in the middle when it should be taking off, the climax has the cachet of the ultimate Jungian threat. Inkheart gets a pass for making books seem cool (if scary): if only it could have done the same for movies. 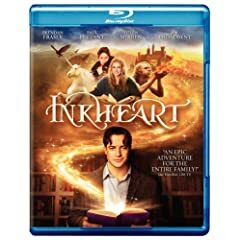 Inkheart hits Blu-ray in a solid but less-than-spectacular transfer. Detail is strong, black level has proper depth, and color is eye-catching. But there's also some unevenness to the picture quality (perhaps partly endemic to the source and its special-effects work? ); the image betrays occasional digital artifacts and soft shots. The Dolby TrueHD 5.1 mix is unimpeachable, though, expertly prioritizing dialogue, effects, and music and offering substantial wraparound immersion. Warner also supplies a few bonus features, beginning with "A Story from the Cast and Crew" (6:36, HD). Here, Funke introduces the storytelling-handoff game "Tell Me a Story," which was "played" by cast and crew over the course of production as a videographer captured each turn. It's a cute idea executed well, despite what had to have been annoying practical complications. "From Imagination to the Page: How Writers Write" (10:38, HD) features author Cornelia Funke, showing her at work and allowing her to explain her process. Also interviewed about Funke's talent are Helen Mirren, Eliza Hope Bennett, Paul Bettany, Brendan Fraser, Iain Softley, producer Ileen Maisel, and Jim Broadbent. Nine "Deleted Scenes" (13:36, SD) offer a tour of the cutting-room floor. Lastly, in "Eliza Reads to Us" (3:46, HD), Funke introduces Bennett reading a favorite passage from Funke's book that didn't make it into the film. The disc also comes with a Digital Copy for portable playback flexibility, and is BD-Live enabled for access to additonal online content. All site content © 2000-2019 Peter Canavese. Page generated at 04/21/2019 01:42:35AM.